Join our Facebook page if you would like to receive regular updates about Envision's work, forthcoming courses and projects, and to share your news and views. "Excellent day - informative - well presented"
"Great fun - good chance to get lots of creative ideas to make group facilitation more interesting and memorable"
"Good mix of fun activities, working with others - course was interactive so felt involved throughout"
The next open course will take place in Hull in March 2013 (date and venue tbc). Please contact Envision if you are interested in reserving a place on this course. Envision has worked jointly with Edinburgh Development Group (EDG) to develop this four-day person centred planning facilitation course. Together, we have run six very successful sell-out course and we are excited to be able to continue this joint working now in Yorkshire. The next open course will take place in Hull in May 2013. Please contact Envision for further info or if you are interested in reserving a place. Communication is the cornerstone of all human relationships. Yet, many people lack techniques required for effective interpersonal communication. They may not understand how they come across to others, nor how to interpret other people’s intentions. This can seriously affect a team’s performance. The emphasis during the course will be on developing self-awareness through experiential learning and reflection. You will have the opportunity to work in a supportive group environment to develop your own communication skills and think about how to apply these within the context of your own team, your work and your life. This course is regularly run as part of EVOC's ongoing training programme. Please contact Envision for further information. Clackmannanshire Council's Services for Older People commissioned Envision to develop a one-day course on person centred working. Helen delivered this course to all staff working in all areas of the service (10 courses in total). The focus was on values and attitudes, as well as frameworks and tools, showing how small changes can make a big difference. Helen worked with Steve Coulson of Edinburgh Development Group to facilitate team development days for adult services in Clackmannanshire. 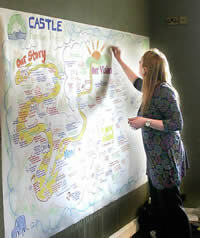 Facilitating away days and strategic planning events continues to be a big part of Helen's work. 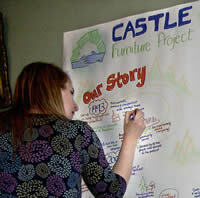 Recent facilitation assignments have included a staff away days with SCLD, a MAP planning event with Castle Furniture Project in Cupar, a team building and planning day with the Community Friends project in Paisley and a strategic planning day with managers from Falkirk Council's Community Education Service. Helen is suporting Shared Care Scotland with the development of a workbook for exploring individual's hopes and expectations from short breaks (respite). This workbook is being used in a series of workshops througout 2011. Helen's input is to the design and graphics of the workbook. Helen has just been commissioned by the National Local Area Co-ordination Development Team (part of SCLD) to evaluate the first two years of their work. This is an exciting project, invovling interviews and focus groups with a range of stakeholders, as well as desk-based research and writing. There will be an event to publicise the key findings in May / June 2011. Envision and Edinburgh Development Group are working together on a year-long programme of work with St Joseph's Services in Midlothian. The programme includes Dare to Dream training, the Big Plan, training in person centred support planning, as well as mentoring, coaching and Action Learning Sets. Renfrewshire Women's Association invited Helen to facilitate their away day to help them look at their vision for continuing their work. It was a really creative and inspiring day - sharing stories and renewing energy for the work ahead. Helen was commissioned by My Choice My Voice to help them and their organisation (Support for Ordinary Living) think about how people supported by the organisation could be more fully involved in staff recruitment. This piece of reearch was published as a booklet, "Who's in Charge?" and has been used to inform the development of recruitment policy within the organisation. Helen continues to be a member of the tutoring team on the award-winning Higher Education Certificate (HEC) in Person Centred Approaches, where she is leading modules on Essential Lifestyle Planning and Planning for Inclusion. Bringing together the philosophies of the Person- Centred Approach and Person Centred Planning, this accredited and innovative learning experience is designed for people who support others to lead valued and inclusive lifestyles based on individual choices and preferences. The HEC in Person Centred Approaches for Social Care Workers is recognised by the Scottish Social Services Council as an appropriate qualification for the registration of staff in the categories Housing Support and Care Home Services for Adults. In Paisley, Helen worked with the STAR Project to facilitate a process of project user engagement in the direction of the organisation. On behalf of Stevenson College Edinburgh, Helen undertook a programme of intensive staff training for Newbyres Village - a new service for older people in Gorebridge run by Midlothian Council - aiming to engender the philosophy and practice of person centred support. Subsequently, the same training programme was rolled out across all older people's residential services run by Midlothian Council. Helen worked with the Borders Voluntary Sector Providers Group to produce a set of Guidelines for Person Centred Support Planning in the region. She has recently been working with a group of people with learning difficulties to make these guidelines fully accessible. Helen has designed a new personal development 'mapping' tool, incorporating graphics, for PhD students at Glasgow university. 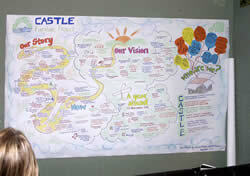 Helen continues to offer graphic facilitation services for all kinds of events, meetings and conferences. Below is a photograph of Helen's graphic for a conference organised by ARC Scotland and the Learning Disability Alliance Scotland on the effect of competitive tendering in learning disability services. Helen worked with the Community Education Service in Falkirk on a whole-service review, involving graphically facilitated consultation exercises with all key stakeholder groups across the service. Helen was recruited by Equity in Education to be a sessional person centred planning facilitator with the Transforming Transitions project. 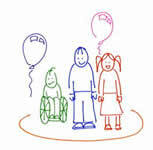 This project will be working with children, young people and their families to support them to make plans for the future.